Let’s face it – we’re a nation on the go! Quick, easy, and healthy snacks are the ideal choice for people of all ages, but it isn’t always easy to tell which is best to munch on. In fact, the Huffington Post reported that Americans spent $374 billion on snacks like chips, protein bars and pretzels in 2014. Unfortunately, Large amounts of salt, sugar, and fat can be found in many of the snacks in grocery aisles. Parents try to keep pantries stocked with healthy snacks aside from fresh fruits and vegetables, but sometimes get duped by snacks with misleading healthy labels. 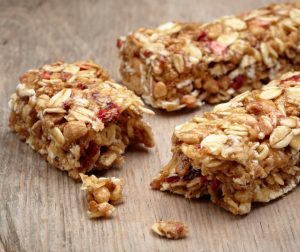 Granola bars – Most cereal bars contain whole grains and fruit as ingredients, but a large amount of added sugar and trans fats make these snacks an unhealthy choice. Try some of these recipes you can make at home. Graham crackers – Graham crackers don’t hold any nutritional value. They’re light and crunchy, but you’re better off eating a whole grain cracker with cheese and an apple slice for some added fiber and calcium. Reduced-fat peanut butter – Natural peanut butter is a great spread that contains healthy fats and protein. When lowering the natural fat content, the healthy fats often replaced by syrup, soy protein, and various oils. Natural nut spreads are the way to go – give cashew or almond butter a try! Yogurt (for kids) – Adult-targeted yogurt is typically made with milk and probiotics, but the version aimed at children typically has a lot of added sugar. Veggie chips – Veggie chips are initially made from vegetables, but are then processed with salt, and most of the nutrients are lost. Best alternative? Slice up veggies like cucumbers or carrots and crunch away!